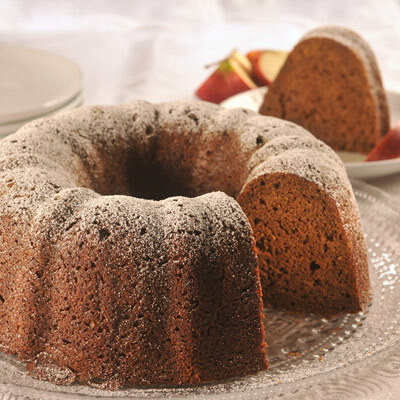 Pumpkin Apple Gingerbread Cake is wonderfully moist and has great flavors, too. To add an extra flair, serve it with a soft ice cream or whipped topping. PREHEAT oven to 350° F. Grease and flour 12-cup Bundt pan. COMBINE flour, baking powder, ginger, baking soda, pumpkin pie spice and salt in medium bowl. Beat butter, granulated sugar and brown sugar in large mixer bowl until creamy. Beat in eggs two at a time, beating well after each addition. Beat in pumpkin, apple and molasses. Gradually beat in flour mixture. SPOON batter into prepared Bundt pan. Bake for 55 to 60 minutes or until wooden pick inserted in bread comes out clean. Cool in pan on wire rack for 15 minutes; invert onto serving platter. Dust with powdered sugar before serving. Serve warm with Hard Sauce. BEAT 1/2 cup (1 stick) softened butter and 1 teaspoon vanilla extract in small mixer bowl until smooth. Gradually beat in 2 cups sifted powdered sugar until fluffy.